Advantech, the embedded platform and integration services leader announces a strategic alliance with Cittadino to target multiple markets including digital signage, self-service kiosks and other graphics-centric applications. Cittadino is a leading digital signage integrator and software content developer based in Germany, they cover all forms of digital communications ranging from software to hardware applications. Cittadino has successfully tested and certified two of Advantech's X86-based digital signage media players- ARK-DS306 and ARK-DS520. Both digital signage media players are high performance solutions for versatile digital signage applications. ARK-DS306, powered by an AMD Embedded G-Series APU with the AMD A50M Fusion Controller Hub system chipset, provides a power-efficient platform for high-performance multi-media content delivery. Based on this new APU platform, ARK-DS306 offers an outstanding visual experience with full multi-media capability, while maintaining very low power consumption. The other Advantech digital signage platform that Cittadino has certified is the ION2 based graphics digital signage media player ARK-DS520. The ARK-DS520 is powered by an Intel Atom D525 dual-core processor with integrated NVIDIA GT218 (ION2) graphic module for full high-definition (Full HD) playback. Through this partnership, Cittadino and Advantech will bring together their expertise in software and hardware to offer resellers a ready to use platform customised for their desired applications. 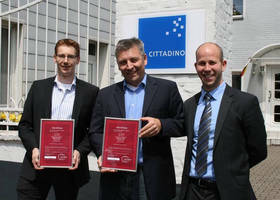 "With Cittadino we have a software partner that is strongly focusing at turnkey solutions for the distribution channel. Together we will make it easier for resellers to step into the digital signage market and offer ready-to-go solutions", Said Bas Smeets, Advantech's Business Development Manager for Intelligent Services. "Due to certification processes and validated proof of concepts between Vendors like Advantech and Solution Providers like Cittadino, customers and IT Partners obtain reliability in their SME Digital Signage projects. This is an essential fact for Channel Partners and IT Integrators, who are planning their market entry or to develop the Digital Signage market." Out of the box" solutions are a huge and important step ahead for the whole Digital Signage industry." Said Peter Medam, Cittadino's Head of Project Management. Founded in 1983, Advantech is a leader in providing trusted, innovative products, services, and solutions. Advantech offers comprehensive system integration, hardware, software, customer-centric design services, embedded systems, automation products and global logistics support. Advantech Digital Signage Solutions deliver industrial-grade reliability; ideal for mission-critical digital signage deployment where 24x7x365 availability is the key. Our mission is to enable an intelligent planet with solutions that empower the development of smarter working and living. (Corporate Website: www.advantech.eu).